LingTree lets you quickly define linguistic tree diagrams and save them as graphic files. 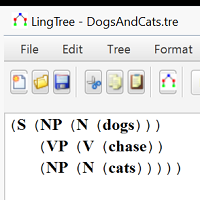 LingTree is a tool that lets you easily describe a linguistic tree and produce a graphic image of it. 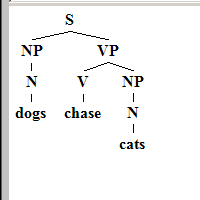 You can use it for syntactic, morphological, and phonological tree diagrams. 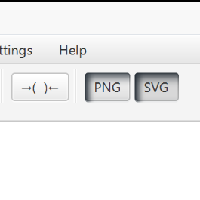 It outputs in PNG and SVG formats. With the SVG format, you can also use a tool like Inkscape to add extra features to it, such as curved lines and arrows. You can then insert these LingTree-produced tree diagrams in linguistic documents or web pages. It is easy to enter a description of a tree by using a simple parenthesis notation. After describing the tree, you can quickly see what it will look like. You can then easily save it in any of two graphic formats for use in your documents: PNG or SVG. What operating systems does this software run on? The software runs on Windows, Mac OS X, and Linux operating systems.